Hannah Genders admires gardens that will continue to delight long after the show’s over. 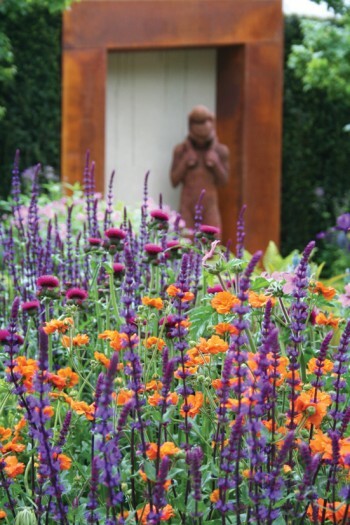 It’s 11 years since Dan Pearson created a garden at Chelsea – I know this because it is also 11 years since I did a garden at Chelsea, and my little garden was opposite Dan’s garden on Main Avenue. The whole team proved to be excellent neighbours; we stored leaflets in their shed and I remember borrowing lots of things from them during the build, which is so helpful when you are in the middle of London and unable to get anywhere easily. Dan is a brilliant designer and, for many people in my field, a real hero for his knowledge and execution of natural planting schemes – and his garden at Chelsea this year proved that the accolade is well deserved. He said that his Chelsea garden this year would be his last one and that he had only wanted to do a commission that would be rebuilt after the show. The commission came in the form of Chatsworth House, the challenge to recreate part of the Chatsworth estate garden that would be naturalistic in its style and rebuilt after the show back in the estate grounds. After visiting Chatsworth, Dan chose the ornamental trout stream and Paxton’s rockery to bring to the show. The garden sat in the large triangular space at the top of Main Avenue, with the bustle of Chelsea happening all around it – this is a difficult and exciting area to design and he had done it superbly. Large rocks placed on top of each other looked like they’d been there forever, but it was the planting that really caught my eye. It was soft and natural looking, but so seamless that it was as if the whole garden had been there forever. Grasses and wildflowers, when uprooted like this, can easily wilt but all the plants looked amazing and the more you looked the more you saw, even orchids nestling near the stream. A beautiful, original garden that not only got gold but also won Best in Show. The other garden that stood out for me was Chris Beardshaw’s “Healthy Cities Garden” (pictured). Again this was a garden to be rebuilt, and not only was it stunning, it also contained a strong and positive message. The garden was designed as the centrepiece of a regeneration programme in Poplar, East London. The re-sited garden will become an oasis where local residents can socialise, relax and enjoy the space. The centrepiece that Chris had designed is just a small part of the gardens being developed in this area of London; the surrounding landscape will have wildflower meadows and allotments to promote healthy eating and being outdoors. The “Healthy Cities” community project is particularly aimed at children, with the idea that if you can give children a healthy start in life, through good food, green space and outdoor play, the benefits will be reaped for a long time to come. The sculptures in Chris’ garden told this story, such as a wonderful one called “Trust” where a child sat on a father’s shoulders. The water running through the garden gave reference to the River Thames and the steel tree and screens at the back of the garden told of Poplar’s industrial past. Tightly-clipped box hedges referenced the structure of the community in which this garden will be rebuilt and the loose, colourful planting showed the community’s diversity. The brightly-coloured orange geum ‘Princess Julianna’ nestled alongside dark purple irises and perfect deep pink lupins. Seating among the planting will allow the residents of Poplar to really enjoy the spectacle. In this area of Poplar, trees would have been pollarded in times past (this is where branches are cut back to the trunk to encourage regrowth every few years). This pollarding was done to make wood for charcoal burning and again it was referenced in the Chelsea garden with pollarded field maples (Acer campestre). Good to see this lovely tree at Chelsea as it doesn’t often make an appearance. I loved this garden – with its strong design and stunning planting it would have worked well in many situations, but the thought that it was being rebuilt for a local community to enjoy made me love it even more. I told Chris I would like to follow this story up and visit the garden in its permanent home, which I fully intend to do later this summer. Chris got another well-deserved gold medal for this garden.